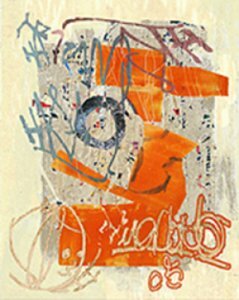 Judith Engel Jacobs, an Ann Arbor native and U-M School of Art & Design graduate, has exhibited her drawings, collages and monotypes for over 45 years locally, regionally and nationally. Always interested in the worn surfaces and graffiti of city walls, she transitioned to digital printmaking in 1999. In her recent series, Wall Portraits, she creates imaginary walls onscreen using Photoshop layers made from her photos and scans of various materials including her own paper and paste collages. After further manipulation, the image is printed on a digital fine art printer using archival (pigment-based) inks and paper.